I have never had a bad time at SPX, even when I was delirious with virus a couple of years ago. 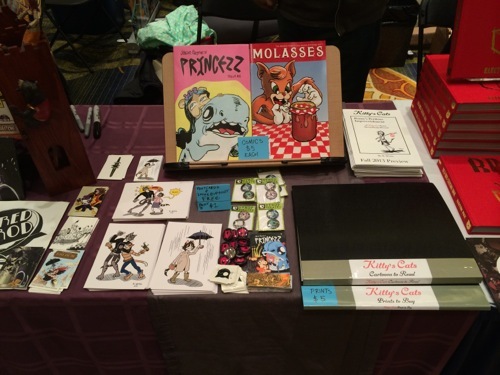 SPX 2014 was no exception, especially since it was the first time I actually had table space to promote “Kitty’s Cats”. I was lucky enough to share a table with Jared Axelrod and Leah Riley. I split my section (pictured above) with Jason Payne of Syrup Pirates, publisher of “Molasses”. Our immediate neighbor was cartoonist and tattoo artist, Electric Pick who had traveled all the way from Hong Kong for the event. I couldn’t have asked for more jovial and entertaining table mates. Due to the steady stream of attendees, I didn’t have much time to check out the other exhibitors. I did manage to sneak out and talk to Becky & Frank (Capture Creatures), Caitlin Major and Matthew K. Hoddy (Space Pyrates), and Shmorky (Butthug). A finer assembly of cartoonists and all around nice people cannot be found anywhere else! I also enjoyed hanging out with Ryan and Jason from Chapel Hill Comics, who are on record as the first store to stock “Molasses”. On the bus ride home, I managed to borrow Jared’s copies of Ignatz Award winner Sam Bosma’s “Fantasy Basketball” and “The Hanging Tower”, both of which should be required reading for anyone who likes Fantasy, RPGs , or just plain good storytelling. I was already aware of Sam’s fantastic illustrations, but this was the first time I had read his comics. He has that rare gift for seamless efficient characterization that marks the best comics creators. I would like to thank everyone who picked up my “Kitty’s Cats” postcards and purchased “Molasses” this year! I hope we meet again in 2015!